Social media has become such a ubiquitous part of our lives that it’s difficult to remember a time before Facebook, Google, Twitter, Instagram, etc. So ingrained are these platforms in our daily routines that we seldom stop to ponder their effect on ourselves, other users, and/or the larger society. 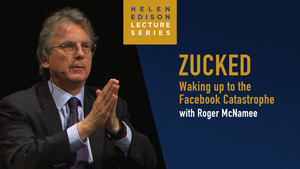 As an early financial advisor to Facebook founder Mark Zuckerberg, venture capitalist Roger McNamee is uniquely positioned to consider those effects. In conversation with San Diego Union-Tribune’s Publisher and Editor-in-Chief, Jeff Light, McNamee discusses the concerns that led to the publication of his recent book, Zucked. He starts by describing Facebook’s business model, which is predicated on enticing users to spend ever-more time on the site to maximize advertising exposure and on selling members’ data to those advertisers. McNamee outlines the use (or misuse) of algorithms to tailor the “Facebook experience” to each user. “Likes,” targeted News Feeds, comments, online games and other features are designed to reinforce the user’s sense of belonging to a larger community, which of course serves a basic human need. This seems harmless enough on the surface, but McNamee argues that the net effect is to create a “Facebook bubble” around the user, in which already-held theories and beliefs are constantly reinforced while opinions that may challenge those beliefs are discouraged or hidden altogether. In that light it should come as no surprise that roughly 40% of adult Americans believe things that are demonstrably untrue. More pernicious, and potentially more damaging to society, is the outsized influence wielded by social media platforms on civil discourse and the democratic process itself. A society that cannot agree on basic facts is a society that cannot function effectively. McNamee cites two momentous events, the Brexit vote in the UK and the 2016 U.S. Presidential election, as instances where Facebook and other social media were manipulated by Cambridge Analytica, the Russian and Chinese governments, and other disruptive agents in such a way as to influence the vote’s outcome. As the evidence for this manipulation steadily mounted McNamee confronted the Facebook leadership, who at that time refused to acknowledge the severity of the problem or change their practices. Thus, began McNamee’s disillusionment with social media and growing sense of alarm over what he perceived to be a threat to democracy. Though McNamee believes this threat is very real, he is nevertheless optimistic. He points out that there is still strength in numbers, and voters can pressure legislators to protect consumer privacy by ending the unchecked (and in McNamee’s view, wholly unnecessary) “data mining” employed by the tech sector. They can also require social media platforms to make efforts to verify information before posting, at the very least by identifying the information’s true source. McNamee also insists that we social media consumers can and must do a better job of educating ourselves. Determining which news and commentary sites are trustworthy is a good start, and McNamee notes that there are tools available to help. José Cabezón is Professor of Religious Studies and the XIVth Dalai Lama Professor of Tibetan Buddhism and Cultural Studies at UC Santa Barbara. Cabezón edited a collection of essays entitled Buddhism, Sexuality and Gender (1992), one of the first scholarly works in the field. His participation in a 1999 conference hosted by the Institute for Religion in the Age of Science (IRAS) led to further intensive research and another book, Sexuality in Classical South Asian Buddhism (2017). In 2007 a group of gay and lesbian Buddhists from the Bay Area wrote a letter to the Dalai Lama, asking to meet with him for clarification of what the group regarded as some of the homophobic tenets of Buddhism. His Holiness agreed to the meeting, during which he expressed sympathy with the group’s concerns but argued that he could not adjudicate the matter by himself, since the tenets are codified in ancient texts. Rather, a consensus among the worldwide Buddhist community was needed. 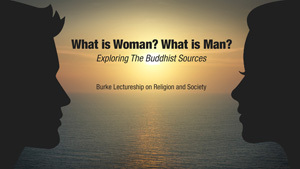 In his presentation for the Burke Lectureship, Cabezón examines those texts for what they may tell us about fundamental Buddhist views of gender and sexuality. The texts were written largely in Sanskrit between the 1st and 9th centuries C.E. and present a surprisingly complex view of the topic, with some aspects familiar to the modern Western mind and others decidedly foreign. As Cabezón notes, they are often “not what we want to hear.” He traces a woman’s sexual life journey from sexual (biological) embodiment at conception to old age, in the process outlining the belief in four biological sexes (2 normal, 2 abnormal or “queer”) and their determining factors, karma as always being foremost. Determinism – a foundational tenet of Tibetan Buddhism – is key in establishing causal links between sexual biology, gender, sexual desire, and sexual pleasure. Cabezón also discusses the treatment of male sexuality in the texts, noting that sexual ethics for men are described in exhaustive detail while none are listed for women (other than fidelity to their husbands). Men are allowed access to prostitutes, and prostitution is considered neither a crime nor a moral failing. In fact, prostitutes are uniformly portrayed in a positive light, whereas wives frequently are not. Regarding marriage, the texts maintain that the goal is not expression of love but the creation of strong bonds between families. By contrast we know little about the lives of “queer” people in early Buddhist societies, since there is little mention of them beyond acknowledging their existence as one of the four genders. It is the classification of genders other than biological male and female as abnormal, along with a strongly patriarchal bent, that troubles many modern Buddhists in the West. According to José Cabezón the study of ancient Buddhist writings on gender and sexuality may be thought of as the study of a cultural construct, one that remains relevant to Asian Buddhist and Western convert communities today. Where is one of the last places on earth you would expect to find a never-before known lake? Certainly, any of earth’s best-known deserts…the Sahara, Gobi, or Kalahari right? Technically fitting the definition of a desert by standards of precipitation, Antarctica could also be on that well-known list of dry places. In 2006, Helen Amanda Fricker was sitting at her desk studying new satellite data when she made a starting discovery – a set of active lakes that exist underneath the ice in Antarctica. 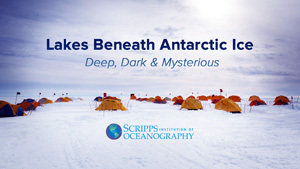 Join Helen, a 25-year veteran of Antarctic ice sheet research, and learn about the discovery, exploration and drilling of these mysterious phenomena at the southern reaches of our planet. Trumpeter Stephanie Richards has performed and/or recorded with such luminaries as Henry Threadgill, John Zorn, Anthony Braxton, Butch Morris, and the Pixies. With her acclaimed debut solo album in 2018 Fullmoon, Richards announced her intention to expand the boundaries of contemporary jazz, and demonstrated the skills to do so. For her 2019 release Take the Neon Lights, New York City-inspired poems from cultural icons including Langston Hughes, Maya Angelou and Allen Ginsberg provide the backdrop for a sonic portrait of NYC that is equal parts dazzle and grit, like the fabled city itself. Richards is a UC San Diego Music Department faculty member and co-director with trumpeter Dave Douglas of New York’s Festival of New Trumpet Music (FONT), and has inaugurated a West Coast version of FONT in collaboration with Fresh Sound, UC San Diego Extension, the San Diego Symphony, and others. In the FONT West concert, also entitled Take the Neon Lights, she performs at San Diego’s intimate White Box space with some heavyweight collaborators: bassist Mark Dresser, keyboardist Joshua White, bass clarinetist Brian Walsh, and drummer Andrew Munsey. Richards’ interest in “tone color, texture and ‘unique sounds'” is on full display as the music ebbs and surges; at times lyrical, almost plaintive, while at others times it growls and roars. Underpinning these shifting sonorities is a sense of restless exploration; each band member probes the boundaries of conventional structure and their defined roles in a jazz ensemble while maintaining a three-way dialogue with fellow musicians and the listener. This is adventurous, challenging music that resists easy categorization, but the audience’s engagement is amply rewarded. 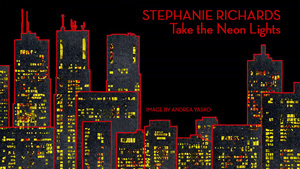 Take the Neon Lights marks Stephanie Richards as a talent to be reckoned with. Constructed languages, or conlangs, are popular features of many science fiction and fantasy tales. Examples include Barsoomian (Edgar Rice Burrough’s John Carter series), Elvish and Khuzdul (Tolkien’s Lord of the Rings trilogy), Klingon (Star Trek), Na’vi (James Cameron’s Avatar), and Dothraki and Valyrian (George R.R. Martin’s A Song of Ice and Fire). Thanks to the efforts of dedicated – some might say obsessive – fans, these invented languages occasionally slip the bonds of their native genres, as witnessed by Klingon translations of Shakespeare and the Bible. Not all conlangs have roots in fantastic literature. The most widely-spoken “auxiliary language,” Esperanto, was created in the late 19th century by a Polish ophthalmologist, and was intended to be an easy and flexible second tongue that would foster peace and international understanding. UC San Diego Linguistics Professor Grant Goodall was fascinated by languages at an early age, and quickly found himself drawn to Esperanto; through his study of Esperanto he developed an interest in other conlangs. 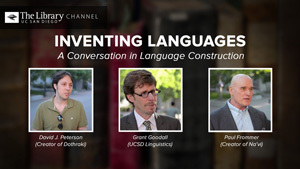 In addition to Goodall’s remarks about his linguistic adventures in Inventing Languages, two of the most popular contemporary conlangs, Na’vi and Dothraki, are discussed by their creators. Paul Frommer was tasked by Avatar director James Cameron to create a language for his science fiction epic set on an alien world. Frommer describes a process which entailed setting certain rules for the new language, dubbed Na’vi, which were drawn from various Earthbound tongues, including English, the Romance languages, and several Eastern European languages. The primary challenge was to create a language that seems sufficiently alien to our experience, yet could be learned quickly by decidedly human actors portraying the language’s native speakers while also lending itself to a vocabulary that could be expanded on short notice. David Peterson, co-creator of the Dothraki language used in Game of Thrones, faced a somewhat different set of challenges since the basics of Dothraki were established in the novels upon which the series is based (complete with translations). Peterson’s first task was to reconcile inconsistencies in spellings across various books, followed by establishment of certain rules of grammar and pronunciation based on common usages in various modern languages – key elements in Peterson’s ability to form new Dothraki vocabulary upon demand. Like Frommer’s Na’vi, Peterson’s Dothraki needed to sound exotic while retaining just enough familiarity for actors to learn and speak the language convincingly. In recent years conventions, workshops, seminars, websites, and user groups have sprung up around fictional languages, including Na’vi and Dothraki, as fans seek an immersive experience based on their favorite novel, film, or TV series. Thus far none have yet achieved the international prominence of Esperanto, but devotees are convinced that it’s only a matter of time.